Dr. Jack Kevorkian was known as "Dr. Death" since at least 1956, when he conducted a study photographing patients' eyes as they died. Results established that blood vessels in the cornea contract and become invisible as the heart stops beating. In a 1958 paper, he suggested that death row inmates be euthanized, and their bodily organs harvested. In 1960, he proposed using condemned prisoners for medical experiments. In 1989, a quadriplegic, too handicapped to kill himself, publicly asked for assistance, and Dr. Kevorkian began tinkering on a suicide machine. But a different patient -- Janet Adkins, a 54-year-old with Alzheimer's -- was the first to test the device. It worked. Kevorkian then provided services to at least 45 and possibly more satisfied customers. In 1997, however, the U.S. Supreme Court ruled that Americans who want to kill themselves -- but are physically unable to do so -- have no Constitutional right to end their lives. 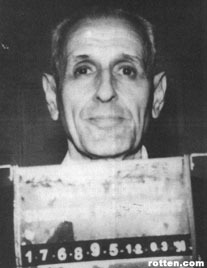 Kevorkian was sentenced to 10-25 years in prison, but was paroled in 2007, in failing health and nearing his own death.